British cartoonist and animator Hugh Brian White was born in Dunstable, Bedfordshire on April 4th, 1902. He was educated at local schools and self-taught as an artist, joining his local newspapers Luton Reporter and Luton News as a sports cartoonist and caricaturist in 1916. In 1924 he joined G. E. Studdy and William Ward as an animator on the Bonzo cartoon films, moving to Pathé Pictorial to animate Sid Griffiths Song Cartoons (1926) and Joe Noble’s Sammy and Sausage series (1928). Wth Griffiths he produced animated advertisements for Superads (1929), then made a sound cartoon Tropical Breezes (1930), featuring Hite and Mite. His last cartoon was On the Farm (1932) from H. M. Bateman drawings, made in Raycol color system. Whites first strip was Mr. ‘Enry Noodle (1924) in Pearsons Weekly, followed by Jolly Jinky (1931) in the same journal. I lis first daily was Adam and Eva (1932) in the London Evening Standard, followed by the Weather Pup panel (October 1932) in the Daily Mail. This led to the acceptance of his most successful strip, The Nipper, which began a long run in the Mail frani August 30, 1933, and brought such ancillaries as postcards, annuals, etc. With the wartime paper shortage the strip was discontinued and White tried strips for children’s comics, taking over Deed-a-Day Danny from Hugh McNeill and creating Little Tough Guy, both in Knockout (1942). He did war service with the police in Liverpool and Luton (1942-1944), and in 1945 formed a publishing company, B. H. White Publications, with his cousin. He reprinted the Nipper strips in painting book form and produced a new Nipper comic, Careful Nippers, a road safety comic, and Nippers AZ Animal Book. In 1948 he published Bernard Shaw through the Camera. He produced Nipper film strips for Pathé (1951), and illustrated the Focal Press series of books on how to animate (1955). In 1955, in an unprecedented move, London agent Frank Betts bought the rights to Bill McLeans American strip, Double Trouble, then syndicated in The Star, and White was contracted to continue it in a completely British version. When The Star was purchased by the Evening News, the strip was continued from October 16, 1960 to 1967. White returned to drawing strips for C. Thomsons children’s comics in 1956 with Shorty in Beezer, followed by a revival of Keyhole Kate in Sparky (1968-1974), Tich and Snitch in Buzz (1973), and Plum Duffy in Topper (1974). 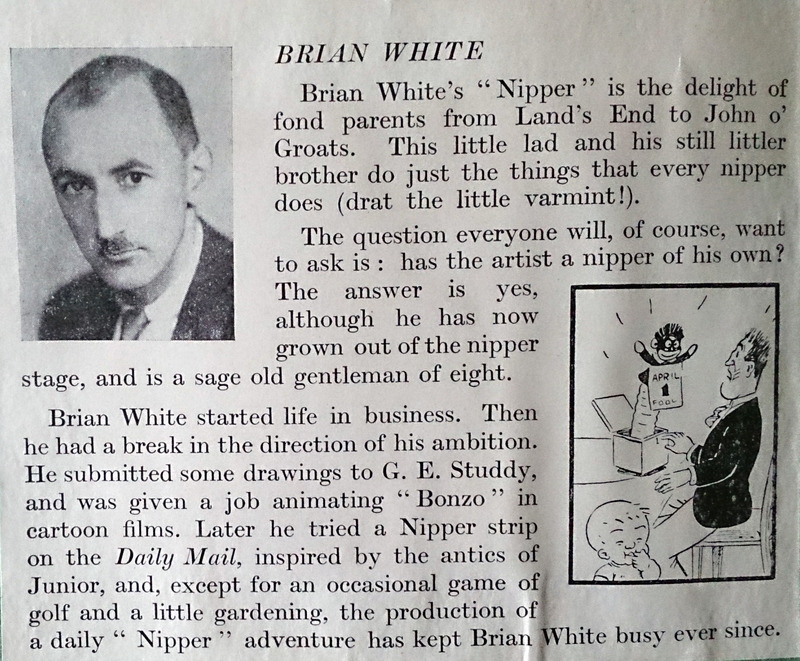 Although less ingenious and inspired, Whites current kid” strips, carry the stamp of his good-humored Nipper.